The countdown is on, with the inaugural SailGP event in Sydney, Australia now just 25 days away. The SailGP Sydney event will take place on Friday 15 and Saturday 16 February 2019. Each national team will compete in fleet races, culminating with the top two teams racing for a place on the winner’s podium in a match race on Saturday afternoon. Team Japan recently picked up their F50, boat number six, the last boat to be built. It’s a completely new build on a very tight deadline to be ready. So, they’re going to have to rely on their sailing team to take past experiences and come together with only a handful of training days ahead of the event in Sydney. The Japan SailGP Team was able to accomplish some critical goals during a recent testing session in New Zealand, despite getting a limited amount of time on the new supercharged F50. “Despite the session getting cut short, the experience we have in our team means we’re in pretty good shape, but we have a lot to do in Sydney in terms of gelling as a team.” commented CEO and Helmsman Nathan Outteridge. Beyond his own experience as an Olympic gold and silver medalist in the 49er class, and a two-time America’s Cup skipper, Outteridge can call on a crew with some of the most recent and relevant experience to the SailGP format of racing. Outteridge says crew communication is going to be critical as the teams take on the challenge of fleet racing with six of the fastest boats on the planet. He points to his fellow Australian, Tom Slingsby his and Australia SailGP Team, as the favorite for the debut event of SailGP. Great Britain SailGP skipper and helmsman Dylan Fletcher, the current 49er World Champion, will be busy in the USA competing at the Olympic classes Miami World Cup event (27 Jan – 3 Feb) in the 49er with Stuart Bithell. 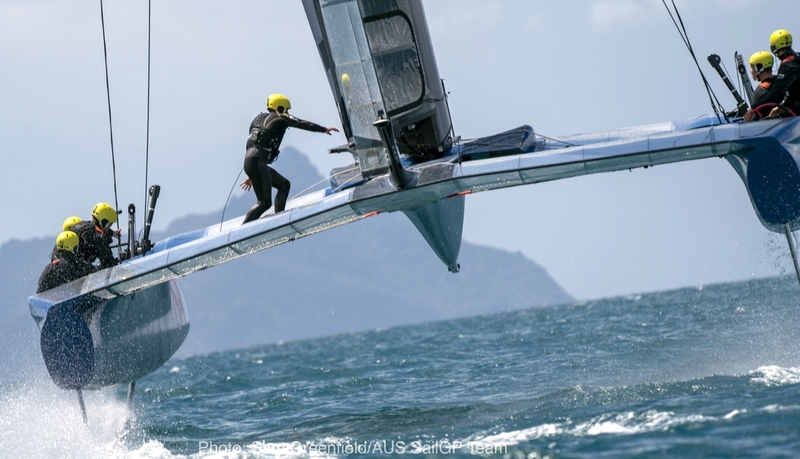 The British Sailing Team pair will then flip over to Sydney for their first SailGP event (15 – 16 Feb). The Great Britain SailGP team comprises: skipper and helmsman Dylan Fletcher, CEO & Wing Trimmer Chris Draper, Flight Controller & Tactician Stuart Bithell, and Grinders Richard Mason and Matt Gotre. The second event is in San Francisco which will take place on Saturday 4 May and Sunday 5 May 2019.